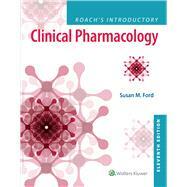 Prepare your students for successful practice and NCLEX-PN success with this updated 11th Edition of Roach’s Introductory Clinical Pharmacology. Developed by nurses for nurses, this practice-oriented text not only helps students learn about drugs and their effect on real people, but also models how to relay this information to patients. Known for its impeccably accurate drug content, this bestseller focuses on basic principles and the nurse's responsibility in medication management. The book’s easy-to-understand writing style combines with empowering online resources, including videos, NCLEX-PN-style review questions, and drug monographs, to help students hone their critical thinking and problem-solving skills as they master one of the most challenging content areas in the curriculum. NEW! Unique Concept Mapping introduced in Chapter 5, Patient Education help students both process and visualize important concepts. NEW! A List of Abbreviations is now on the inside back cover for easy reference. NEW! Concept Mastery Alerts highlight and clarify commonly misunderstood concepts. Pharmacology in Practice Case Studies focus on assessment, administration, or teaching issues that affect real-life patients and are revisited in the Think Critically questions which ask students to explore options and make clinical judgments related to the administration of drugs. The Nursing Process framework presents care of the patient as it relates to the drug and drug regimen, as well as Checklists of Relevant Nursing Diagnoses. Patient Case Study scenarios threaded through each chapter offer a “simulation-focus” to help students get a sense of real world nursing. Nursing Alerts quickly identify urgent nursing actions that may be required when managing a patient receiving a specific drug or drug category through. Drug Interaction Tables provide at-a-glance information about the likelihood of a patient problem when multiple drugs are given. Summary Drug Tables list drugs from the classes discussed in each chapter, including names, uses, frequent adverse reactions, and general dosing information. Lifespan Considerations boxes meet the needs of specific populations at risk or needing specific drug administration considerations through practical. Herbal Considerations boxes provide information on herbs and complementary and alternative remedies. Chronic Care Considerations prepare for situations that may arise during drug therapy for patients with chronic illnesses, such as diabetes, hypertension, or epilepsy, including issues of polypharmacy through. Know Your Drugs (matching questions), Calculate Medication Dosages (dosage calculation questions), and Prepare for NCLEX-PN (NCLEX-style questions), appear at the end of each drug chapter. Learning Objectives, Key Terms, and Drug Class lists identify potential errors and safety concerns to help students focus their reading and enhance their mastery of course concepts. This leading content is also incorporated into Lippincott CoursePoint, a dynamic learning solution that integrates this book’s curriculum, adaptive learning tools, real-time data reporting, and the latest evidence-based practice content together into one powerful student education solution. Lippincott CoursePoint improves the nursing students’ critical thinking and clinical reasoning skills to prepare them for practice. Learn more at www.NursingEducationSuccess.com/CoursePoint.